BEFORE: After a James Bond break yesterday, we’re back to the Coen brothers with their first Academy Award winning film, Fargo. The film stars Frances McDormand again (seen in the last two Coen brothers films) in addition to newcomer Steve Buscemi. AFTER: Fargo is classified as a Crime/Drama on IMDb but I also found it to be quite amusing with the Coen brothers signature dialogue strewn throughout. The attraction for this film is by far the story. 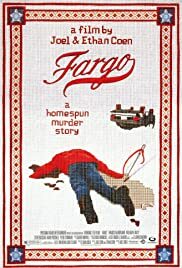 The premise may seem rote and overdone, a kidnapping for ransom money, but the details are what makes Fargo unique. Jerry Lundegaard (William H. Macy) is the stereotypical car salesman (I can get you a good deal on that Trucoat) and it translates perfectly into his role as a mastermind of his wife’s kidnapping. Frances McDormand, who won the Academy Award for Best Actress in a Leading Role, definitely does a fantastic job worthy of a nomination, but I’d have to see the other contenders to make a final judgement. What I didn’t like about Fargo was the organization. Much like Raising Arizona the other day, Fargo is subjected to an unusual structure. The breaks in between the three acts (roughly every half hour) are very apparent. It’s almost as if Fargo is three short films spliced together that also happens to have an overarching story. In other words, the content was great, it just didn’t seem to flow all that well. I’ll spare you from any more blabbering. I’ve had a cold for the past few days and I just need some rest instead of writing down incoherent thoughts. The most important thing you should take away from this is that Fargo can be quite odd and striking but it’s also amusing and entertaining. You should consider it for future watching. Or not. That’s your choice.